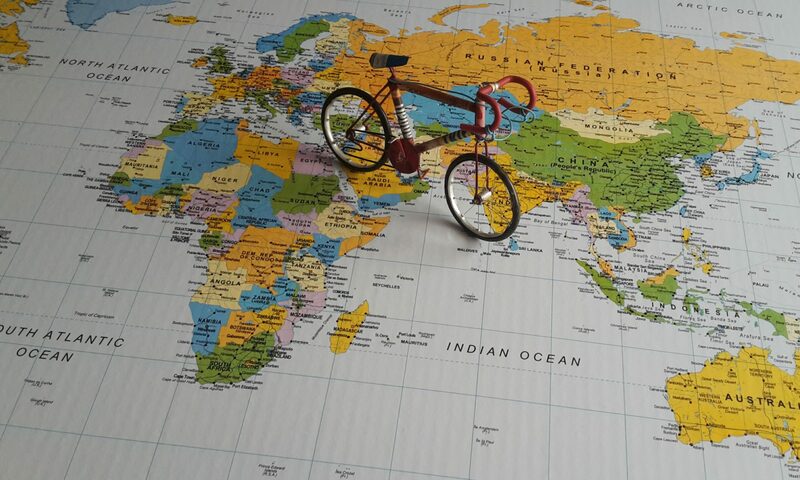 Useful information for planning a cycle tour of your own. From the planning stage to what equipment may be of use and some tips if you plan on flying with your bike. Well, it’s been 15-months since I purchased the MSR Hubba Tour 2 tent, so I thought it was about time to write an updated review of the tent. As I said in my previous post, I was excited to see the MSR Hubba Tour 2 and saw it as the long-awaited replacement for my old MSR Velo and immediately bought one in February 2017! But a replacement it certainly isn’t, it just doesn’t even come close! The tent doesn’t work! Now I’m not too sure whether MSR tested this tent out before releasing it, but if they had I’m sure that they would have worked out some of the major problems with the tent for themselves! The main problems being, it leaks along the seams, the fly stretches too much then sags, and there’s not enough space between the fly and inner tent allowing them to make contact (no matter what you do) this then lets condensation drip in! And the fly screen is a waste of time! After enjoying a few nights away in the new MSR Hubba Tour 2 without any problems I was enjoying the new tent, okay the material on the outer fly was pretty flimsy, and I needed to tighten it up a couple of times before settling in for the night! No matter how taught I thought I’d got the fly, as soon as the air temperature dropped and it got a bit damp the fly would sag then drip condensation! Maybe this was one of the tents un-doings having to tighten the fly so much? And yes maybe there wasn’t enough room between the inner tent and outer tent and no matter what I did they always touched causing condensation to drip in! But I was prepared to put up with these as I said I liked the layout of the tent and it suited me down to the ground. But then the inevitable night came when it rained! No problem I’m in my new tent everything will be fine! When the morning arrived, I noticed that there were one or two wet patches in the corners of the inner tent. There was also some water in the vestibule, but I decided to put these down to condensation, after all my tent was only a couple of months old and had only been out a handful of times there was no way it could be leaking, could it? The next night it started to rain again, and I must admit that I was a little nervous about staying dry! I was right to be nervous the water was pouring in! Through the corners of the inner tent, from the toggles that attach the inner tent to the outer tent and from around the front vestibule! To say I wasn’t happy was an understatement, the new tent that I had waited years for was leaking like a sieve! And to top it all one of the of the inner tent attachments broke! I wasn’t happy! After returning home from my trip, I wrote to MSR explaining the situation. The reply I got back was not what I’d expected! I was practically called a liar and told it must be condensation as nobody else has complained! As you can imagine this immediately got my back up and felt that it was very bad customer service on MSR’s part! To be told I’m lying, especially after I’d sung the praises of the MSR Hubba Tour 2! Eventually, after a bit of communication MSR agreed that I should send the tent to them (at my expense) so they could test it. After a few weeks, I got word back that yes the tent was faulty and they would replace it, but unfortunately, they didn’t have any in stock! I asked if I could have the old one back as a stop gap, but that had been thrown away! My new tent eventually arrived a month later, but because of one thing and another, I never got to use it again until this year. Roll forward to this year (2018) and the start of the camping season and yes you’ve guessed it, on my first night out in the rain the new MSR leaked and even more than the old one! Although one good thing the inner tent seemed to stay dry this time! It was, however, leaking in the corners of the vestibule and this time above the vestibule door; it poured in through there! Whoever passed this tent off for general sale should be fired, was it not tested in the field first? (If you’ll pardon the pun) Apart from the water tightness issues and the inner tent touching the outer fly! There’s an issue with the fly screen on the main door! What purpose does that serve? Yes, it keeps fly’s from entering by the main door, but with no fly screen on the vents, it’s useless! Do these issues not get passed on to production? If they want to contact me, I’d be more than happy to help! Does MSR not care about the quality of their equipment anymore? I’d already read one or two disparaging reports about the MSR Hubba Tour tent but chose to ignore them as I am such a big fan! But you can only push somebody so far! Although my main problem with the MSR Hubba Tour 2 is that I want it to work, I don’t want it to fail! I think it’s layout and design are very good and ideally suited to cycle touring, but the reality of it all is that it doesn’t! And after defending the tent for the past 15-months, I feel I can no longer. What has happened at MSR? Their equipment used to be solid, reliable and long lasting! Unfortunately, that doesn’t appear to be the case with the MSR Hubba Tour 2 tent! MSR Hubba Tour 2 a brilliant tent as long as it doesn’t rain! I have since received another replacement outer tent which like the previous ones still leaks! As of May 2018, I am currently awaiting another response from MSR. The Quad Lock stem bar mount is used to mount Garry’s phone onto the stem of his handlebars, simply twist and lock! Quad Lock with specially adapted phone cases which you can get for all popular phones. Unfortunately, there wasn’t one that fitted Garry’s phone! Not a problem you can buy a separate adapter to stick to the back of the phone case. Its position right in front of him allows him to see any incoming calls and it’s quick release system allows Garry to answer them before they ring off, even with gloves on it’s easy to release! Pull down the locking nut and twist to lift off! The Quad lock has proved invaluable when Garry wants to use his phone as a navigation tool. No more having to try and ride along holding the phone in one hand and steering with the other, hoping he doesn’t have to brake suddenly! The quick release system also works well when Garry wants to take a picture; it’s there right in front of him! Not buried somewhere in the bottom of his bar bag and once again it’s quick and easy to release. It’s an invaluable piece of kit for any cycle tourist. The Anker PowerCore+ 26800 is Garry’s latest acquisition. It’s an ultra-high capacity power pack that is compatible with iPhones, Android phones, GoPro’s and most other USB-charged devices! 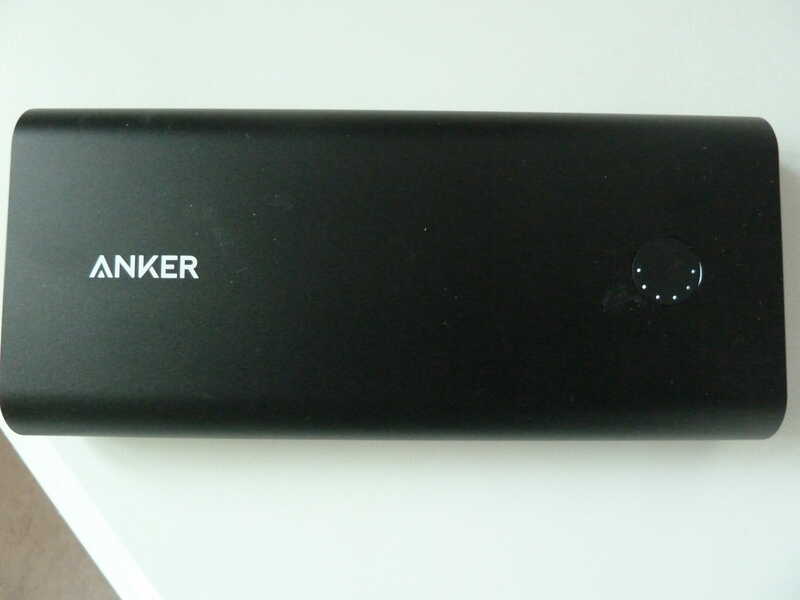 After looking around at the various power packs that are on the market, Garry came upon the Anker power pack range and the Anker PowerCore+ 26800 in particular. After reading some favourable reviews and its ability to charge different USB items at the same time with its triple outlets, coupled with the number of times it’s able to charge something before needing a recharge itself, Garry just had to buy one! The Anker PowerCore+ 26800 coupled with the Anker quick-charge wall charger means it charges twice as fast, Garry’s first charge took 8hrs. 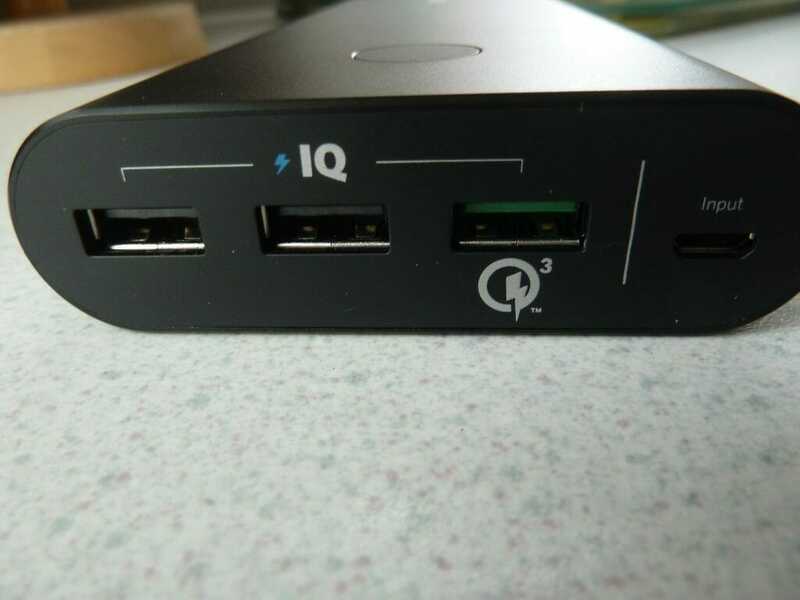 And its Qualcomm Quick Charge 3.0: Using Qualcomm’s advanced Quick Charge 3.0 technology, PowerCore+ allows compatible devices to charge 85% faster! It also has a bank of lights allowing you to know how much charge is in the unit. It’s a bit bulky measuring in at 180x80x24mm and a bit heavy weighing 590g, but with all these power hungry items that we all seem to need these days it’s charging abilities far out way its weight and size! And should come in very handy on Garry’s next tour particularly if he ends up camping wild! To test the Anker PowerCore+ 26800 out Garry decided to take it on a little tour. Garry was camping out for three nights and four days in some pretty cold conditions, but the Anker PowerCore+ 26800 performed better than expected, bearing in mind the cold temperature! In that time Garry managed to keep his phone, which was in constant use and his GoPro which was also being used to film the tour completely topped up. He even charged them both from the Anker PowerCore+ 26800 on his return home to see if he could run it out, but the very useful led display was still showing more than half of its power left! A very useful piece of kit and Garry can’t wait to take it on a longer tour, knowing that he will always have plenty of power to keep everything fully charged. 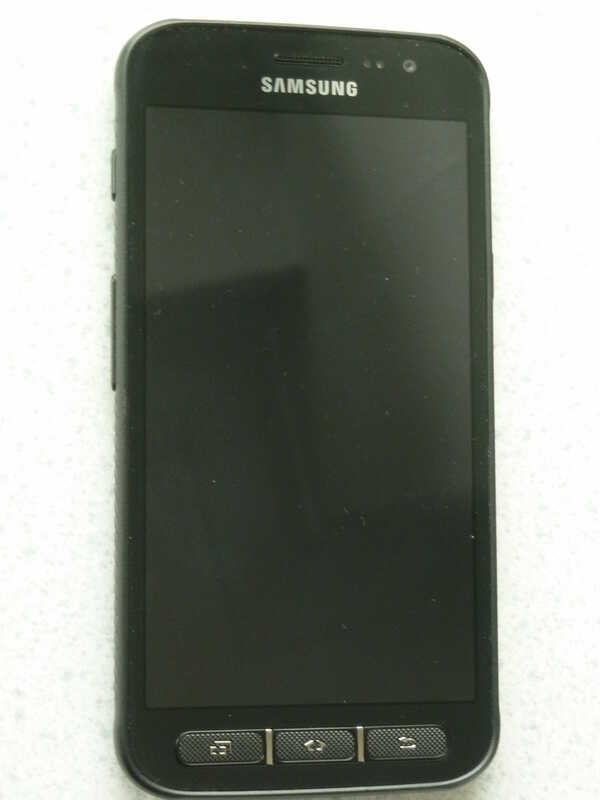 Garry’s newest phone is the Samsung Xcover 4. After Garry’s old phone packed up, he needed to get a new one, so he started to look at the different Samsung phones around. (Garry’s had a Samsung for several years now and wanted stick with them!) After looking around, he quickly realised that most new phones have built-in batteries that can’t be changed by the operator! Garry had a separate battery and charger for his old phone and perceived not having a separate battery on a new phone as a bit of a pain! Having a separate battery and charger allowed Garry to leave the battery on charge, be it in a hotel room, campsite toilets or from the Busch & Müller IQ2 charger on his bike, and still meant he was able to use his phone. He remembered what it was like before having a spare battery! Leaving the phone in campsite toilets to charge, where he then worried as to whether it would still be there when he returned! Garry looked at several different models including the new Samsung Galaxy X9, but with Garry’s lifestyle that seemed to be a bit too fragile! There was one phone however that stood out and seemed to suit most of Garry’s needs, the Samsung Xcover 4! The Xcover 4 has a water and dust-resistant body and is designed to stand up to everything from extremely high and low temperatures to mechanical shock, rain, ice and sand! And it has a changeable battery! 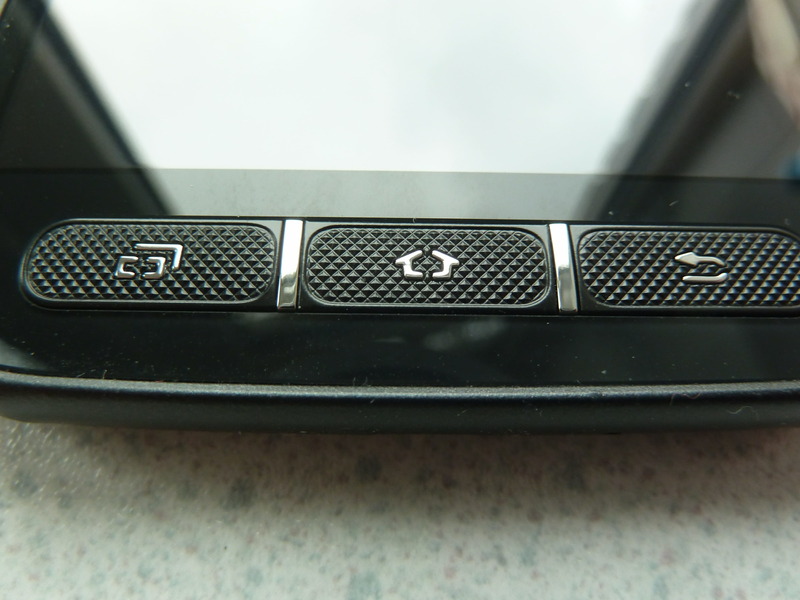 The Xcover 4 also has several hard keys on the front making it easy to use when wearing gloves or if you have wet hands. A double tap on one of the keys opens the camera, very useful when Garry’s cycling along and wants to take a photo! Another key on the side operates a torch! The Xcover 4 isn’t one of Samsungs latest models it’s about a year old, but as was previously said it suits Garry’s need!